Your Teeth Grinding Habit: What’s at Stake? Your smile is more powerful than you may think. Not only are your teeth made of the hardest substance in your entire body, but the human bite is remarkable strong. In fact, when all the jaw muscles work together to close the teeth, they exhibit a force as much as 55 pounds on the incisor teeth and 200 pounds on the molars! We should have no problem grinding up that piece of steak of apple with so much power. However, what if we unleash this pressure and force in other ways – such as teeth grinding. Bruxism is an oral condition (or habit) in which you grind or clench your teeth on a consistent basis. For many, teeth grinding occurs at night while you are sleeping. Imagine the jaw muscles you are using for minutes or hours on end to produce the amount of bite force we know you are capable of. 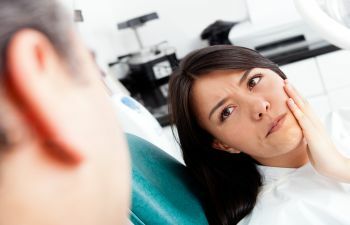 It is easy to understand why bruxism rarely comes without consequences. One of the most common drawbacks of teeth grinding is TMD, or temporomandibular joint disorder. With so much grinding and clenching, you are overusing your jaw muscles and irritating them. This type of TMJ strain can cause soreness, clicking, stiffness and pain in the jaw during the day. You may also suffer from frequent tension headaches due to your jaw disorder. Another setback to your teeth grinding habit is teeth damage. While it is true that your tooth enamel is remarkably strong, it simply cannot handle the persistent abrasions and force from bruxism over time. You may notice that your teeth feel sore or even sensitive as the enamel layer wears thin. You may also be more susceptible to decay and infection, as your enamel is what protects your tooth from bacteria invasion. Lastly, you may sabotage the condition of your dental work, such as fillings, crowns and fixed bridges. Replacing these restorations can be quite costly. What can you do to protect your TMJ and teeth from your subconscious teeth grinding habit? Consult with your dentist. At Gold Hill Dentistry, we specialize in TMD treatment, which often can be addressed by wearing a custom nighttime mouth guard. Call our Fort Mill dental team today to learn more!